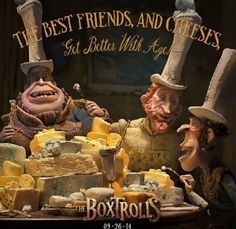 The second part of my double feature was the Laika follow up to the wonderful Paranorman stop motion animated movie The Boxtrolls and it is such a delight. If you have kids that love slime, ooh and goo and things that are disgusting this is a movie they will LOVE! But also kids who like creative worlds and fun characters will like it too. Again I will try and tell you a little bit about it without spoiling anything. It is set in Cheesebridge, a town where there are heavy class distinctions. The main being those with status get to eat cheese. The designated cheese-eaters are identified by a tall white hat. The aristocrats are led by Lord Portley-Rind who in a lesser movie would have been a total villain but as it is he’s just in love with cheese (seriously at one point they choose a large gouda over a children’s hospital!). The Lord has a daughter named Winnifred, voiced by Elle Fanning, who is spunky but not in the typical way we see in these types of movies. She’s actually not in the movie that much and I could have seen even more of her. A man named Archibald Snatcher wants to eat cheese more than anything even though he is so allergic he puffs up with boils all over his face when he does. Mostly he wants status and the importance of the hat and cheese eating. Snatcher is voiced by Ben Kingsley but he sounds just like Michael Gambon. 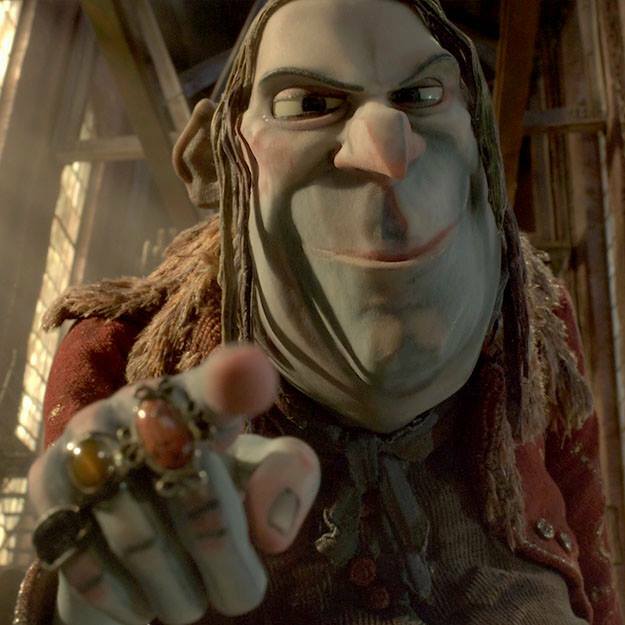 Snatcher makes a deal with Lord Portley-Rind that he will remove all the boxtrolls, a race of stealing trolls, that are the outcasts of the town. If they are all dead than he can be given a white hat and eat cheese. 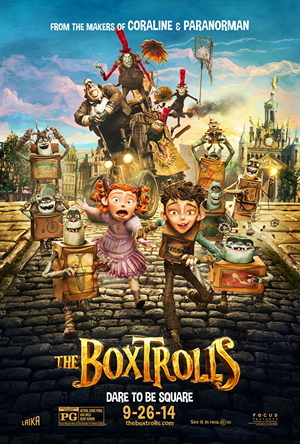 The boxtrolls have been raising a human boy who is abandoned by his father. They call him Eggs because that’s his box. Eggs is voiced very well by Isaac Hempstead-Wright. 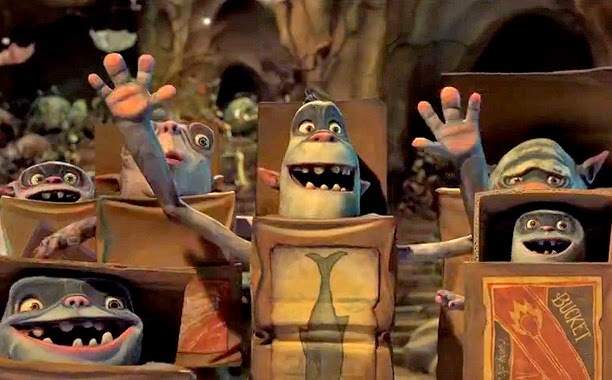 The Boxtrolls are creatures of habit. They operate only according to their nature but Eggs does not and tries to get them to adapt as the story goes forward. 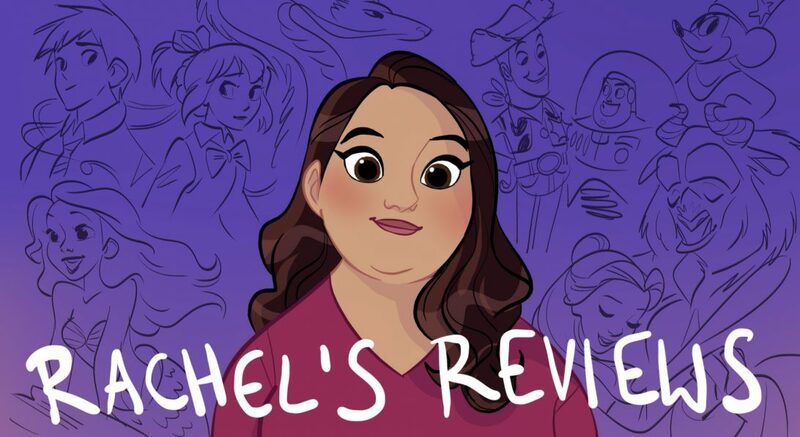 It’s a lot for a kids film to take on- class strife, fighting your nature, loving the downtrodden and seeing value in everyone no matter their label. But fortunately Boxtrolls is up for the challenge. I really loved it. It clips along very well and the score by Dario Marianelli is a lot of fun with a little opera and barbershop quartet music thrown in occasionally. The villain is allowed to win for a lot of the picture. There’s a long time when I didn’t know how they could dig themselves out of the hole they’d created he was doing so well. 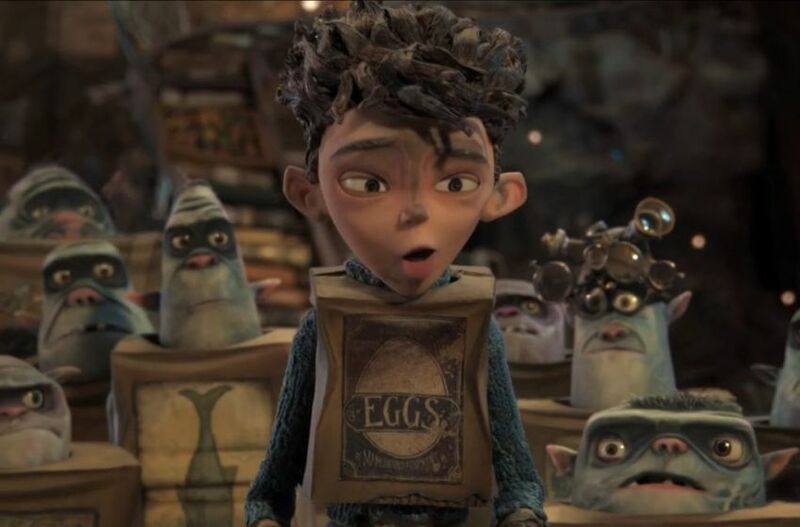 Winnifred and Eggs are very endearing and the Boxtrolls are kind of like grimy versions of the minions- very cute and sweet. The world they created is vivid and it teaches some great values to kids without it being too heavy-handed. Very imaginative and fun. I loved it! There is a scene with a character in drag showing a lot of skin if that is of concern to parents. And like I said it is kind of gross at times but in a fun way. Oh and stay for the credits! Oh and it is not as scary as Paranorman. More appropriate for the whole family. I’m still not looking forward to it much.